2. A little asbestos won’t hurt—There is no safe level of asbestos exposure. Asbestos is a mineral—basically a threadlike rock. It is finer than wool and tiny pieces can be inhaled and stay in a person’s body for years. Mesothelioma, the cancer caused by asbestos exposure, takes many years to show symptoms and by then is very difficult to treat. Unfortunately, for a long time, the dangers were known by companies manufacturing with asbestos, but workers were not protected from exposure. This is why there are so many asbestos lawsuits in the news today. 3. It is safe to test for asbestos yourself—Not really. If you mess around with asbestos, you can release fibers into the air and inhale them during the process. If you suspect asbestos, have a professional inspection. If you know you have exposed asbestos, call an asbestos removal company to take care of it safely. 4. Nothing made after 1979 has asbestos—Wrong! Asbestos-containing materials are still in use, legally in some countries, illegally in others! 5. You’ve never been exposed to asbestos—You probably have. Hair dryers used to have asbestos components and had the potential to blow it out into your air! 6. Any asbestos in your home must be removed—No, if it is not exposed or disturbed, asbestos will not be a hazard. However, during renovations or after natural disasters, asbestos that is present can become airborne. Keep this in mind! 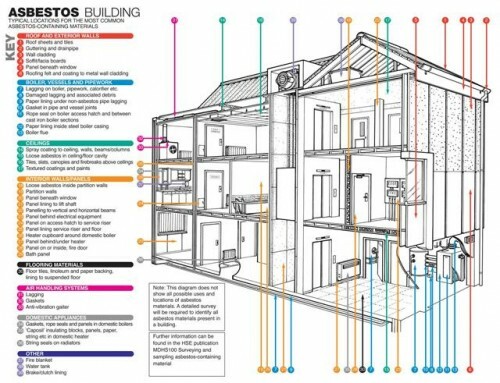 Do you know where to look for asbestos in your home? Awareness is essential to being safe from asbestos exposure. Alliance Environmental Group encourages you to follow the Asbestos Disease Awareness Organization’s Twitter Feed for important information every day! If you need asbestos removed safely and professionally in California, Alliance Environmental Group has a team ready to take care of your project! Contact us! We would like to wish all of you a Happy Passover, Happy Easter or a Happy Weekend, whichever you are celebrating!